Portugal bought about 12,500 6.5mm Mannlicher rifles and carbines from Steyr in Austria, some in 1896, for the Navy and Cavalry, and the remainder in 1898 for the Artillery. The 6.5 x 53R cartridges were first imported from Roth and then made in Portugal. The Portuguese Mannlicher is of the Romanian subfamily rather than the Dutch. 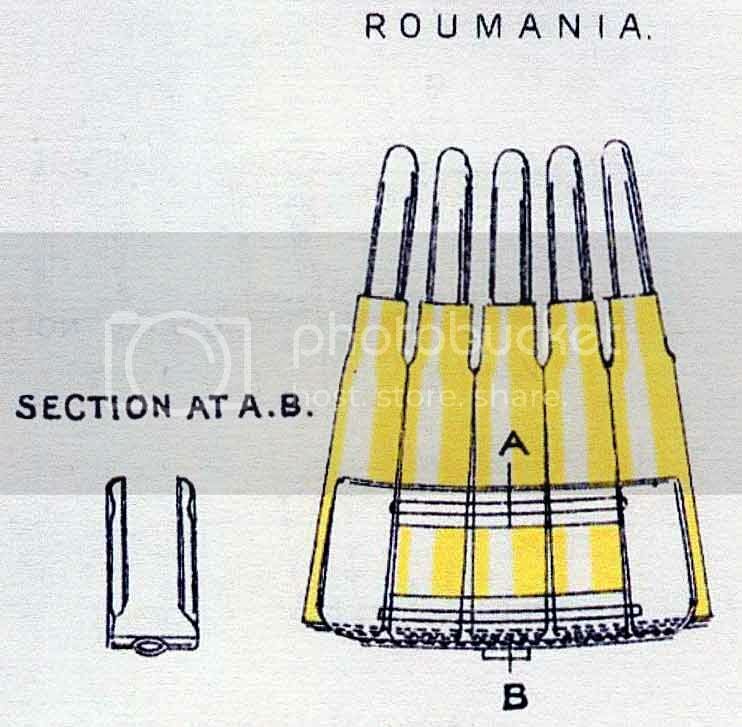 These latter two are very similar but differ in the location of the ejector–the Dutch 1895 follows the typical Mannlicher pattern of attaching it to the left side of the bolt head (left when the bolt handle is vertical) while the Romanian 1893 has the ejector pivoted in the receiver proper, just to the rear of the magazine well. Due to this ejector location the Romanian type bolt requires a clearance cut not found on the Dutch type. Their common ancestor, the 1892 model, is (I am told) similar to the Dutch. The 1892 was made in quite small quantities, but quite a number of them ended up in England, where they were converted into sporting arms. A fair number of the early Mannlicher and Mauser prototypes were sold off in the 1890s & subsequently altered to sporting form, thereby confusing students of arms to no end. In 1946 a few hundreds of the Portuguese Mannlichers were adapted to the 5.6mm calibre (.22" Rimfire), for training. Below is a clip of five Portuguese 6.5 m/96 cartridges for the Mannlicher rifles and carbines. 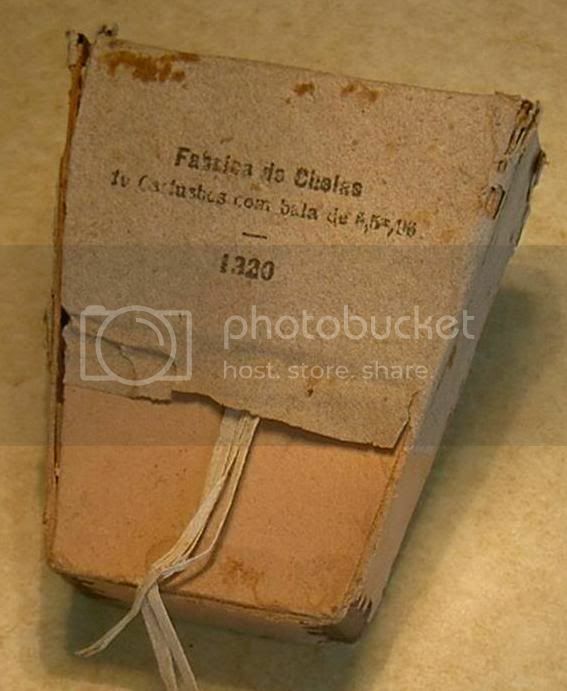 These came from a box/carton labelled “FÁBRICA DE CHELAS 10 Cartuchos com bala de 6,5 m/96 1932”. The carton is similar to the one in the attached photo. Waxed paper was wrapped around the clips in the box, similar to the Dutch packing. Other Portuguese made clips are the same but plated instead of being painted black. The headstamp of the cartridges in the clip is also shown. Edited: I should have added that the above information was compiled from information generously supplied by Telmo Sequeira of Portugal and Bob Taylor of Texas USA. Thanks to both of them. A nice short article. You have shown, along with Ray Mekata, that not everything on the Forum has to be a question. Your concise study expanded my scant knowledge of the 6.5 Portuguese Mannlicher and its cartridge. Thank you. Hope it sets a trend. Very interesting. 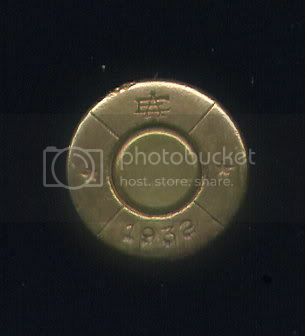 I note that the clip in your photo has the larger sized opening in its sidewall, associated with the M.95 Dutch Mannlicher cartridge, and Mötz states that early Roth catalogues indicate that the 6.5x53R cartridges supplied by them to Portugal were of the M.95 Dutch pattern (Roth Case No.522), rather than the earlier M.93 Romanian (Case No.474). These Roth case numbers were apparently equivalent to DWM Case No.394 (Roumanian) and DWM 395 (Dutch), and according to the measurements given in the DWM book of case drawings the only difference between the two was that the rim of the Roumanian cartridge was 1.9-0.1 mm thick, whereas that of the Dutch cartridge was 1.6+0.1 mm thick. I remember reading somewhere (can’t remember where) that these differences in rim thickness meant that the Roumanian and Dutch rounds were not interchangeable, presumably because of possible headspacing or extractor problems. However, from the fact that the rifles supplied to Portugal were of the Roumanian pattern and the Roth ammunition of the Dutch pattern, it seems that this difference wasn’t as critical as might have been supposed. You read my mind, I had the 1904 edition of the Textbook of Small Arms on my desk as I wanted to re-read the section of clips and chargers. Interesting that in the illustrations, which are by and large accurate, the biggest mistake is the one for the Roumanian Mannlicher. This looks to have more artistic licence than direct experience of the real thing. I’ve read that this cartridge was much in demand in Africa by professional hunters who found the rifle light to carry, highly effective on elephant and yet with a modest report that wouldn’t unduly disturb the rest of the herd. By the way, are the Portuguese clips marked in any way? Are there clues as to whether they’re imported or of domestic manufacture? I would never dismiss anything as being wrong out of hand unless you are very sure. I have seen drawings of a clip looking like the one that you illustrate but no real specimen - yet. 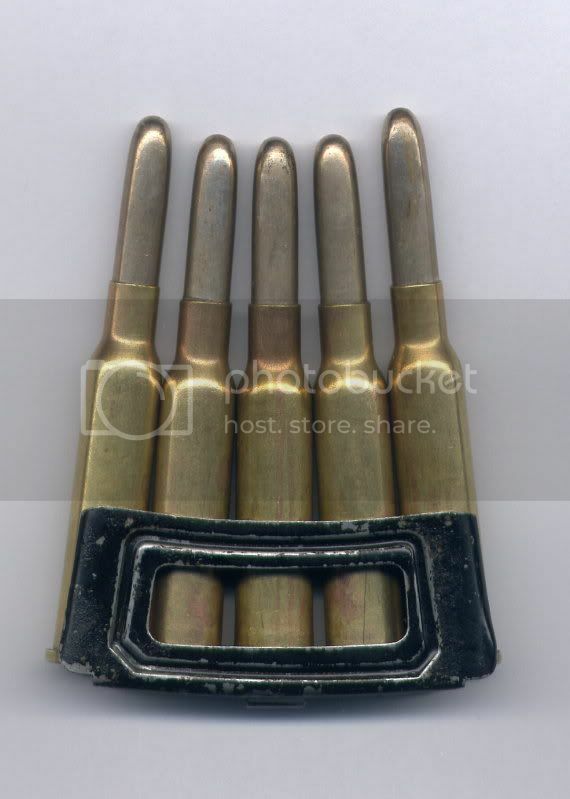 I have two distinct styles of clips attributed to Rumania and there are others, such as the Australian made one and the Dutch ones with the extra hole in the base. Perhaps we need a new thread to air these variants. Portuguese made clips were not marked, which is one way to distinguish those found in Portuguese packets from imported ones. I am assured that the clip that started this thread was of Portuguese manufacture. I presume the early Roth 6.5x53R cartridges supplied to Portugal would have been put up in clips bearing the “GR” monogram? Are any of these known to collectors in Portugal today?